Provide a strong commitment to our community Thank you for the opportunity to provide eyecare for you and your family. Thank you for the opportunity to provide eyecare for you and your family. Our office history began humbly in 1970, when Ray Williams, OD returned to Americus and started an optometric practice in a small office downtown. Dr. Williams was born and grew up in nearby Smithville. Using a combination of hard work, high code of ethics and conduct, good clinical skills, and good business sense, Dr. Williams was able to grow and prosper. In 1988, he was joined by Ken Moates, OD and Valerie Moates, OD. Dr. Ken Moates grew up in Americus and returned with his wife to infuse some new vigor and energy into the practice. Shortly afterwards, Scot Wall, MD, an ophthalmologist from nearby Albany began part-time association with the practice to add surgical expertise. Over the years, the practice also enjoyed expertise, on a short-term basis, from other optometrists, Wayne West, OD, Mark Smith, OD, and Tim Sellers, OD. Then, in 1996, the practice along with Sumter Regional Hospital decided to bring a full-time ophthalmologist to provide surgical care for the local patients. This was how Chanh Tu, MD came to join the practice. In February 2000, the office expanded to include a satellite office in Montezuma. The satellite office in Leesburg was added in June 2008. We now see patients at 3 convenient locations. We have been performing laser vision correction in Southwest Georgia since 1998. In 2005, John Mixon, Jr., OD returned to his south Georgia roots and joined the practice. Our most recent addition to our professional staff, was in 2012, when Americus native Matthew Greene, OD also joined the practice. The practice owes its identity and success over the years to the dedication and ingenuity of Dr. Williams and is grateful to all of the past doctors and staff that have provided care and expertise to our patients. 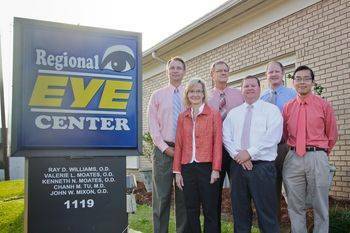 Ours is a proud tradition of providing quality total eye care to all. Ours is a tradition of high-tech care...with a personal touch. Watch short informative videos from our eyecare video library.